Solar charge controllers: minimum usable voltage input? The tech specs all list max voltage, but nothing about minimum source voltage. My application involves a vehicle installation, where I want to have a premium high capacity battery on float charge at all times, powered by an intermediate battery that charges when the alternator is running, both of which are isolated from the starting battery. I know I can do it with an inverter running an AC charger between the two additional batteries, but am wondering if it would be possible to improve efficiency by using a solar charge controller to keep everything DC. But this is only an option if it's capable of utilizing voltages in the 11-13v range that the intermediate battery will present when the car isn't running. 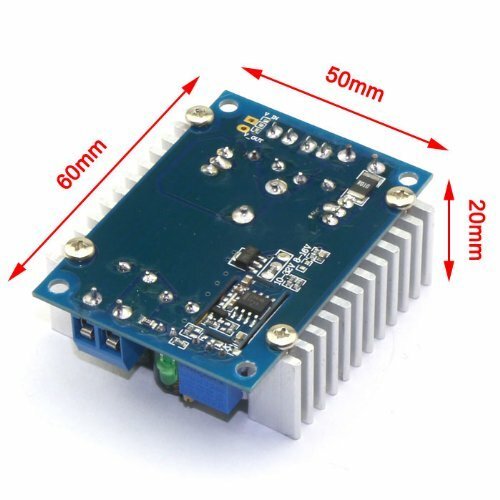 I guess the other alternative is to add in a separate DC up converter module to boost the voltage if the solar charger is not capable of it by itself. Re: Solar charge controllers: minimum usable voltage input? It's not wandering if I put this on top:The DC up verter is your best of the options mentioned whether it is an inverter plus charger or something as simple as a laptop air power brick Set to 17 volts or so and a say 7 amp solar charge controller.Sorry for the wandering to get here. I don't think this will work due to the reverse diodes in a solar controller that keep from back-feeding the panels when the sun doesn't shine...they cost you a half volt or so and when a battery(your intermediate battery) is under a load(charging battery THREE) you will have 12.6 or less volts available to charge with LESS the half volt(.6 v) and you have 12 volts to charge a 12.6 to 14 volt need while charging takes place. Most solar controllers need 17 to 23 volts in for 12 volt systems. So if you plan to use your battery bank often,a battery isolator and the alternator is the better choice and charging from the alternator and an intermediate battery will not provide voltage to charge another battery with a solar controler THE NUMBERS DON"T ADD UP. Good to know, Carl. Solar charge controllers are off the list, then, and one less thing to worry about. So, you would recommend boosting the voltage between the intermediate battery and the inverter, does that improve efficiency? I've been using a West Mountain Radio ISOPwr for charging the pair of batteries I intend to use as the intermediates in the new system, so I'll probably leave that connection as is. I could use my WMR Super PWRgate to maintain the big AGM if I boost the voltage over 14v, or just go with a small inverter and AC charger and skip the booster. The inverter and charger draws about 300ma in float mode, which gives me days of capacity. What current capacity is the third battery and what level of charging does it need? A step up in voltage is pretty much needed and some sort of charge controller. So an inverter and 120 volt style charger or a simple laptop supply (that outputs 75 to 100 watts at 17 volts or so) and a small solar charge controller will do the job , really depends on what equipment you already have . But you most definitely need to raise the intermediate battery's voltage in order to actually charge and float the third battery. The premium battery is a 150ah Lifeline AGM battery. It's marketed to marine and RV users, but there's also an identical SunExtender brand that is marketed to the solar crowd. I've read that the quickest way to kill this battery is to not keep it fully charged whenever possible, so I've been keeping it on a Genius 1 amp charger when I'm not using it. Bulk charging is with a Genius 26 amp charger and this is how I will charge it after a heavy discharge, once I get back home. I do not plan on recharging the AGM battery from the vehicle on a routine basis. This is the first high capacity battery I haven't managed to send to a premature death, which is good, because it's also the most expensive and I'd like to keep it useable as long as possible. The intermediate batteries will be a pair of U1 35ah SLA wheelchair batteries, in parallel and hooked to the ISOpwr. This combination has worked pretty well in the vehicle for a couple of years, already. The inverter is a 400w unit (although I'm going to test a 100w unit as well) and I'll probably hook my Genius 3.5 amp charger to the AGM. The inverter works down to 10.5v, but in testing I've found that in 24 hours a single 35ah battery will discharge down to about 12.5v with the charger on float, so it's unlikely that both combined will ever get below 12v. Would you still recommend boosting the voltage to the inverter? Or would you dump the inverter and charger and go with the Super PWRgate and a booster? I've read that the quickest way to kill this battery is to not keep it fully charged whenever possible, so I've been keeping it on a Genius 1 amp charger when I'm not using it. Bulk charging is with a Genius 26 amp charger and this is how I will charge it after a heavy discharge, once I get back home. I do not plan on recharging the AGM battery from the vehicle on a routine basis. Actually, the quickest way to kill any gel cell (AGM's are a version of gel cells) is to OVERCHARGE or OVERDISCHARGE them. Sitting slightly discharged is not nearly as hazardous. Where a standard lead-acid battery will simply off-gas during an overcharge, a gel cell cannot easily pass gas bubbles out from the gel. Once full of bubbles, the electrolyte cannot property engage the plates. If you've ever pulled a dead gel cell from a piece of equipment and noted the case looks "puffed out," the electrolyte has been bubbled. It can happen slowly or fast, but it's mainly why a gel cell / AGM has a shorter lifespan, and less deep cycle capacity, than a similar wet cell. As long as the equipment discharging the battery will shut off when voltage drops to a level that prevents the battery from discharging too deeply, and your charging circuit is intelligent enough to properly charge and maintain a gel/AGM battery, you will be fine. Given my battery-cidal past (over-charging, under-charging, over-discharging, and under-watering), I've tried to be extra careful with this Lifeline AGM. It's been two years and still performs better than it's 20hr rating, so I'm thinking that the Genius charger circuitry must be doing a pretty decent job of maintaining it, when set to AGM mode. I know Harris says the Genius chargers are a stupid waste of money, but I've had better luck with them than the ones he recommends. Harris looks for "value solutions." When dealing with a mission-critical component, or "lifeline" as you say, then it's prudent to cover the bases. You are on the right track. Hey TGirl,I have not heard you in some time...I hope all is well with you. I've been super busy... not much free computer time. Where a standard lead-acid battery will simply off-gas during an overcharge, a gel cell cannot easily pass gas bubbles out from the gel. Once full of bubbles, the electrolyte cannot property engage the plates. If you've ever pulled a dead gel cell from a piece of equipment and noted the case looks "puffed out," the electrolyte has been bubbled. I've done a little preliminary testing and have decided to go with the Super PWRgate for my project. I tested a relatively small and efficient 150 W Tripp Lite inverter (has no cooling fan) and measured (more accurately, this time) a 500 - 600 mA draw with the 1 A Genius charger in float mode on my big AGM. My 100 and 400 W inverters drew significantly higher current, and a crappy 70 W inverter from my wife's car drew 1500 mA before the charger was even connected. Using a $16 DROK DC step-up converter from Amazon, which I set to output 14.5 V (the recommended input voltage for AGM battery charging via the PWRgate, per West Mountain Radio), I measured an average 35 mA draw from the Super PWRgate in float mode when using an 11 V input into the DROK. Unfortunately, the first time I tried this setup, the magic smoke escaped from the PWRgate and I decided to go ahead and buy the new Rev 2 model while WMR is doing repairs, which is out of warranty. I'm sorry your magic smoke got out. Was the upconverter directly feeding the charge controller? Many upconverters work by pulsing a torrid coil. The output may not have a smooth DC flatline, which isn't a problem for a battery, but can wreck havoc on certain electronics. A filter capacitor may be needed between the two. Hopefully the "version 2" of the PWRgate is more forgiving/robust. Thanks for the update on your project. Sounds like you are almost there! I suspected my ineptitude was the root cause, but couldn't figure out what exactly I'd done wrong, since I thought I'd controlled the voltage and current. West Mountain Radio said multiple components needed to be replaced, beyond the obviously cracked and smoking resistor, and some were going to be special order. The new model circuit board is of a different design and must be more robust, since I hooked it up the exact same way. The converter does have a torroid but I'm guessing I'd need an oscilloscope to determine if the output is truly flat, unless there's a clever way to do that with a multimeter. Does it make sense that staying DC to DC is more efficient by a factor of ten over the inverter? If you are raising the voltage ,you are still using an inverter by whatever name they give it....I think. Actually, "inverting" means "to turn something upside down" which is what happens visually on a scope when creating AC waveforms from a DC source. The "upconverter" terminology would be appropriate for DC. Technically, it's amplifying the voltage of a DC signal. The efficiency is more a matter of the process and components, or literally the conversion method, than simply whether or not it's "an inverter." Some upconverters are horribly inefficient, too. Building anything is a tradeoff between economy (cost), durability (reliability & longevity), efficiency, service-ability, and marketability. There's a tendency to think we can get it all in a cheap (inverter) package, but something has to give. In this case, you may have found the sweet spot between cost and efficiency. Based on my limited knowledge, I think those are pairs of capacitors on both the input and the output side of the toroid. Would those be filtering capacitors? Also, I have no idea what kind of case should I put this gadget in. You can't tell much from the pictures, a schematic diagram would be better for determining the application of those caps. An enclosure would need to protect the unit from the elements wherever this thing will be located, but also allow proper ventilation while operating. I can't really recommend much without knowing / seeing the circumstances. Many enclosures on car systems with such heat sinks are a clamshell design which allows the heat sinks to protrude for airflow. Of course this type of enclosure would need to be mounted in a clean, dry, environment. 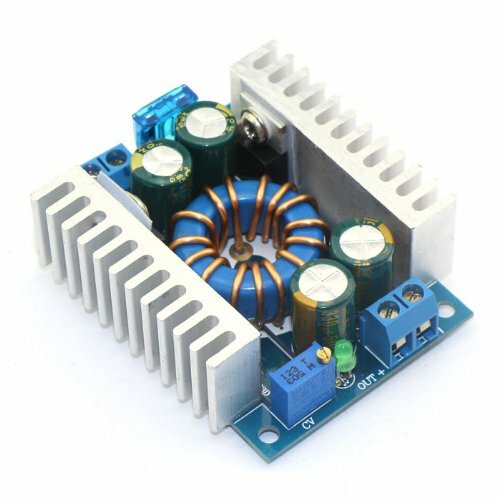 It is obviously an oscillator with the caps there as filters (on input and output)and the toroidal transformer that would only step up an AC voltage ...it is an inverter of sorts,though 'inverter' is more commonly used to describe the 12 to 120 or 240 volt AC power supply devices. The circuit is very efficient and works at very high frequencies to pulse the transformer(toroid) then rectify (make back to DC) the somewhat higher voltage and filter it with the output caps. Same basic circuit as the auto/laptop circuit I suggested early on in this thread. It will need protection from weather and air circulation if running more than a few amps to maintain your 'special' third battery. It is a good choice for what you are doing. Thanks guys! Karma points to you both for your help and patience. Fill us in on the completed install, and what enclosure you decide on. It's a cool project. I've been bench testing the system and so far everything seems to be working well. I've made two different versions of the DC up-converter enclosure, the first one was minus the heat-sinks, since I was planning on running the PWRgate at the 1A charge setting and wouldn't need as much heat management. The problem was that with a 150Ah AGM battery it sometimes didn't flip into float mode, which meant the system drew 200-300mA of power instead of the more efficient 30-40mA. On the 4, 7, and 10A settings it kicks over without fail, so I decided to get a couple more of the DROK units (they're down to $13 now) and some different sized Hammond boxes. I was able to squeeze one into a box with the sides cut out to make space for the heat-sinks to breathe, plus I had space to add a voltmeter to monitor the voltage of the intermediate battery. The system is turning out to be so efficient, over periods of days to weeks without a charge, that I'm leaning towards using some 8Ah SLAs I've got and using my bigger ones for something else. The DROK has been dead on consistent in providing 14.5V to the PWRgate and I haven't had any more magic smoke incidents with the PWRgate I got back from repairs. Here's a picture of the bare DROK converter, the first generation enclosure, and the second generation with the voltmeter. 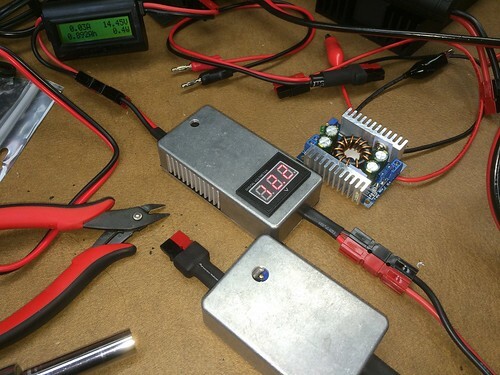 Not a "DC converter", but a buck boost system.. The whole idea sounds convoluted without seeing some type of layout on paper so I cant comment on anything else. I looked at the MFJ unit before going down this road, but I believe it maxes out at 13.8V. I need 14.5V going to the PWRgate for AGM charging. It is pretty crazy and convoluted, but it's motivating me to learn some new skills. The basic scheme is to charge a cheap low capacity SLA battery from a vehicle alternator through an ISOpwr unit, then to boost that battery's output to 14.5V with the DROK on its way to a PWRgate, which will maintain an expensive high-capacity AGM battery on float charge during the often several days I'm not driving the vehicle. Roger that FL... The PS Vs. TS thing was just a side note for edumakationall purposes only.. I wouldnt want someone to expect AC from an inverter that is "just like the power company delivers"! They can come pretty damn close, but the ones (inverters) that mimic true sine wave... are WAY outside our budget. So I focus on the consumer grade equipment little guys like us might encounter. I see you need higher than 13.8 to run your charge controller AND charge your AGM, I will on this point yield to more experienced users, but.... If you need a buck booster to bring your battery voltage up to operate ham gear... or an inverter... I still own and use my MFJ "battery booster" and it DOES what is SAYS it does! (Alibit some caveats).